Ever dreamt of trading and investing in the real stock markets?? Wake up and get yourself registered to participate in the most exciting event of Delhi Technological University ever !!! 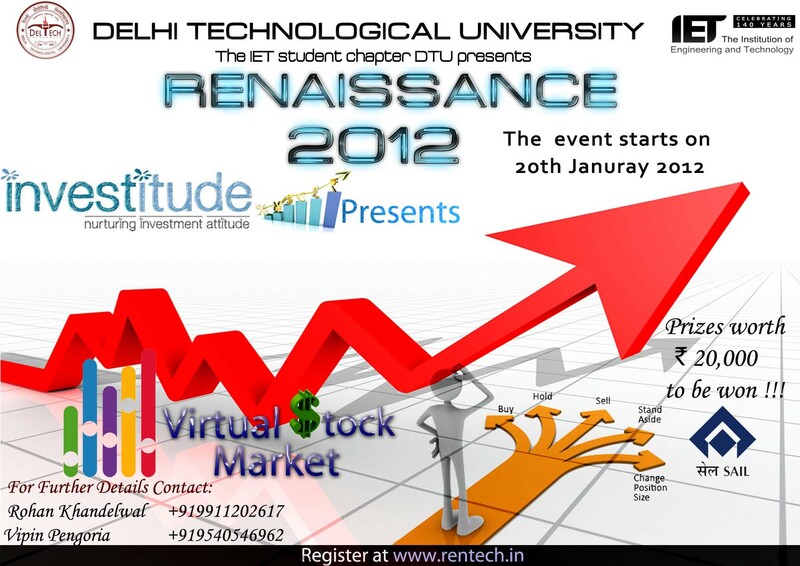 Virtual Stock Market, presented by Institute of Engineering and Technology,Delhi in association with INVESTITUDE, is a real-time stock market simulation game that gives you the opportunity to trade in the US Stock Market. Not only you get a chance to experience the dynamics of the financial world and prove your financial mettle, but you also get to learn and master the art of PRUDENT INVESTMENT. Gain an expertise in trading, and test your fundamentals and financial knowledge Use technical charts, stock alerts, and daily updates to strategize your trades Build and rebuild your portfolio to compete your colleagues and out-beat them with your profits !! When Does the Game Starts? What are the topics covered in the workshop? Whom should i have to contact for more details? 2)Game starts on 20th Jan 2012 and ends on 16th Feb 2012. 3)New players can join even after the game starts. 4)Trading is allowed in all the US-listed stocks. 5)US markets are open from 8:00 pm to 2:30 am Indian Standard Time (i.e. 9:30 am to 4:00 pm Eastern Standard Time). 6)Changes to the portfolio can be made at any time. Orders can also be placed after the markets are closed which will be executed on the next business day. 7)Initial cash balance of US$1,000,000 will be credited to each player’s account. 8)There will be 25% Position Limit on any individual security. This means with a portfolio value of US$1,000,000, you may invest no more than 25% of the total amount in any individual security, i.e. you may not purchase more than US$250,000 worth of Google shares. 10)Minimum stock price for buying or shorting any stock should be US$1. 11)Short Selling is allowed, i.e. selling with a view that the stock price will be going down and buying it back later on Intraday trading is allowed, i.e. buying and selling a stock on the same day. 12)Trading on margins is not allowed. 13)Ranking are calculated on the basis of the current portfolio value. In this stock market simulation game, you compete with the other participants and try to earn maximum profit which decides your rank. 1st – Cash prize of Rs. 1000/- and 50% discount on any course offered by Investitude. 2nd – Cash prize of Rs. 1000/- and 40% discount on any course offered by Investitude. 3rd – 30% discount on any course offered by Investitude. 4th – 20% discount on any course offered by Investitude. 1st – Cash prize of Rs. 2000/- and 100% discount on any course offered by Investitude. 2nd – Cash prize of Rs. 1500/- and 80% discount on any course offered by Investitude. 3rd – Cash prize of Rs. 1000/- and 70% discount on any course offered by Investitude. 4th – Cash prize of Rs. 1000/- and 60% discount on any course offered by Investitude. 5th – Cash prize of Rs. 500/- and 50% discount on any course offered by Investitude. 6th and 7th – 40% , 8th to 10th – 30% , 11th to 13th – 25% , 14th and 15th – 20% discount on any course offered by Investitude. 10% Discount on any course offered by INVESTITUDE for every participant. So come, enter the world of Bulls and Bears, Thrills and Chills, and Flashing Dollars and Crashing Heartbreaks.